Over the years, service clubs develop their own organizational culture and it's interesting to watch a new club set the parameters for what's acceptable and what is not within their own surroundings. Forget free will. Forget that we are all different with different motivations for belonging. Forget that we live in multicultural communities with diverse interests and needs. Some groups still feel the need to dictate behaviors and that is one reason why, in my opinion, our organizations fail to grow. For example, I recently heard of a club that was struggling with the decorum surrounding guest speakers. It's a small group, and the number of regular attendees is less than half of the total membership. Most of them like to hear presentations from community groups, among others, on a regular basis and a few do not. There is one of the members who takes a great interest in the presentations. She will speak to the presenter before and after the meeting and will often ask questions of the guest and sometimes of others. She is there to develop her professional network and broaden her personal knowledge about the community and she admits that she is likely to mention the elephant in the room when others would turn their heads and hope it goes away. Citing this member as an affront to his sensibilities, another member has decided that asking questions doesn't suit him and he has approached the board of directors to suggest that a policy be written that would recommend that as a guest of the club, presenters should only be given "softball" questions. Easy questions, he rationalizes, will make the presentation run smoother and give the speaker a sense of support. That would seem like a somewhat reasonable request; after all, the club doesn't want to offend anyone, right? 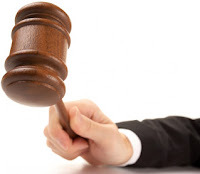 However, such a policy would prevent the young lady and others from learning more in order to support or reject the speaker's stance or cause. It's censorship, plain and simple, and when you start censoring members, or filtering the information that they give and receive, you will lose them. In an earlier post, I encouraged members to be intolerant of intolerance and to speak up when someone says something hurtful. After thinking more about that statement, and then being posed the dilemma outlined in today's post, I'm inclined to ask where is the club president in both situations. It is the club president's responsibility to facilitate a meeting that shows respect to everyone in the room and that may mean limiting questions and comments. It certainly means creating order, including starting and ending on time. When a sensitive situation arises, that time constraint provides a great escape. "Since our time is limited, let's discuss this after the meeting," are simple words that give pause and allow the focus to be redirected when necessary. Service clubs must not expect their members to think alike. We live in a complex world and members arrive at every meeting with multiple personal, professional and social concerns. Your club meeting may be the only time they have to discuss those concerns with others. Kudos to you if you have made your meeting a learning environment where members feel safe to share what is on their mind. Censorship is bullying. Encouraging interaction is preferred. Lead by example; and if you want to retain members, and attract new ones, be sure to provide a respectful forum for all. Are we fostering a generation of violence? The chorus from "Pumped up Kicks" by Foster the People - what does it mean? "All the other kids with their pumped up kicks better run, better run faster than my bullet." On a day that I wrote about the tragic shooting death of a black teenager in Florida, I have also chosen to highlight this frolicking group of young white men singing about crime. Or tennis shoes. Or what exactly? The reason for my choice: awareness. We must be aware of the world we live in cautious not to spin real world challenges into coming of age angst. Enjoy the first one, but be sure to check out the second video for the words. What do they mean to you? Are we fostering a generation of violence? 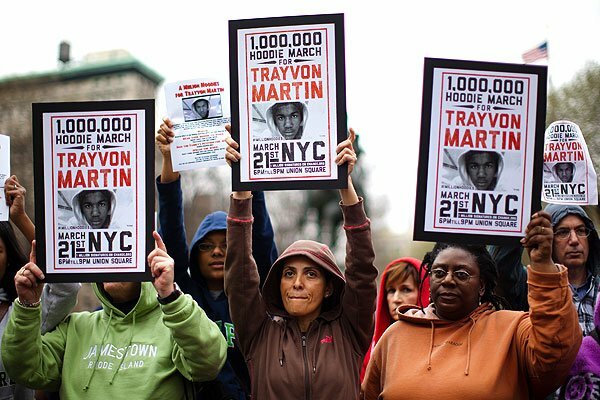 On Friday, thousands of students walked out of school in the US, many joining a Million Hoodie March to stand in honor of Trayvon Martin, a 17-year-old student killed in Florida one month ago, possibly a victim of the controversial "Stand Your Ground" law. President Obama spoke in a personal manner saying, "If I had a son, he would look like Trayvon." His words elevated the racially charged incident to the presidential campaign level prompting the GOP candidates to also speak of the tragedy. Yesterday on Optilink, a member-run listserve of Optimist International, a lone voice commented that the slaying made him very sad because Trayvon volunteered six days a week with his Optimist Club. I had seen that in a similar report in USA Today and if one searches for that information today they will see dozens of news sources have picked up the report that Trayvon's father is active in the Miramar Optimist Club and that Trayvon played football with the program until he aged out. He still gave time to the program by working in the concession stand. One would think that knowing that this young man was a product of an Optimist Club project would make the incident more personal to Optimist Club members around the world. No one else, not even I, have added a comment to the Trayvon Martin thread in the forum. Is it death we fear? Are we afraid to comment on a racially charged incident? Is there concern that as individuals we don't know enough to make a comment? How very sad of all of us. If it were a child with cancer, I can think of at least a half dozen people that would chimed in with a story, a quote, or a call to action. Evil prevails when good people do nothing. This paraphrased quotation is apropos for the situation. There is an elephant in the room and if we are too afraid to speak of problems like guns,diversity and intolerance, they will persist. There is no doubt that published tapes of the 911 call about the Trayvon Martin incident reveal the intolerance of the caller and shooter. He profiled young Trayvon based on his skin color and while we may never know the actual reason he felt he needed to shoot, there is little doubt that the caller pursued a situation after he was told to stop. A young man has died and whatever the circumstance that makes me sad; it shouldn't happen. I hope that by participating in an Optimist Club, I can affect such tragedies. It would seem to me that the call to action for this situation must be directed to the adult members of our clubs. We cannot look the other way. Helping the kids on the football field or with a club program means very little if we fail to monitor our behaviors in other situations. You can begin to change your behavior in small ways. For instance, the next time someone tells an inappropriate joke, say something. Calling foul when someone tells a racist joke may not make you the most popular Optimist Club member in the room, but it will make you one of the most ethical. The time has come to make a stand: we must be intolerant of intolerance. The spring is one of the best times to be an Optimist Club member for during this time of year we get to hear the thoughts and dreams of the young people in our communities through their participation in the Optimist International Scholarship programs. 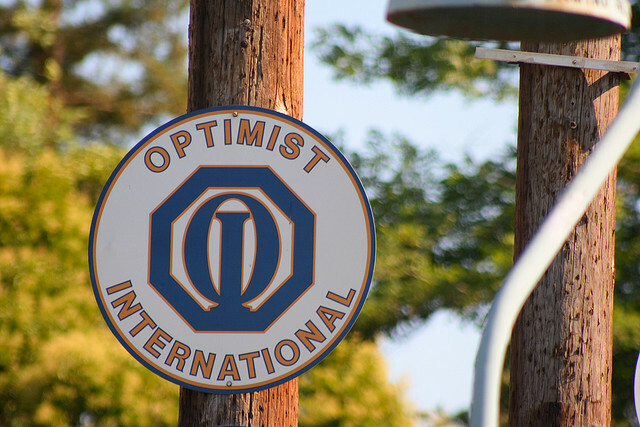 This year the Optimist International Essay Contest, the Optimist International Oratorical Contest and the Communications Contest for the Deaf and Hard of Hearing have similar themes around our organization's founding principles of optimism. 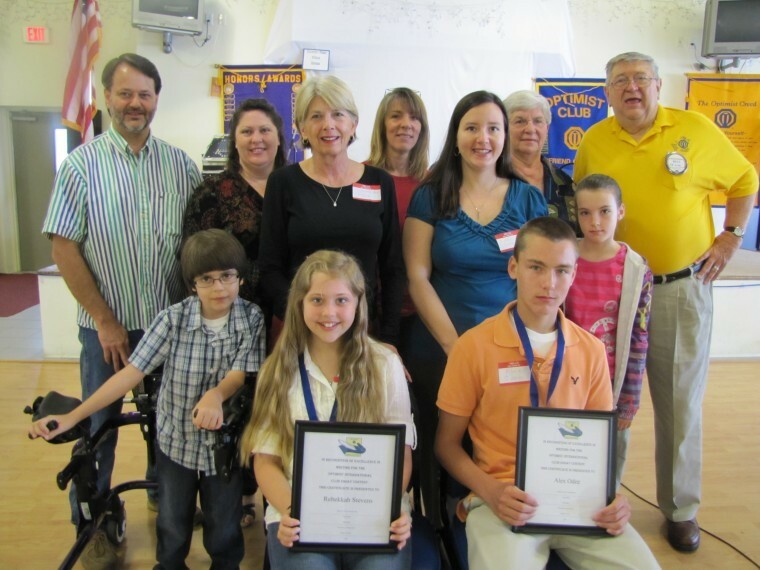 Shown in the picture above are members of the Optimist Club of Perdido Bay, Alabama and the winners of the club Essay Contest. The students wrote about "How my positive outlook benefits my community." Shown below are students from the Windsor Optimist Club of Colorado. Fourteen contestants spoke on the topic, "How my optimism helps me overcome obstacles." Deaf and hard of hearing students will present on the same topic. 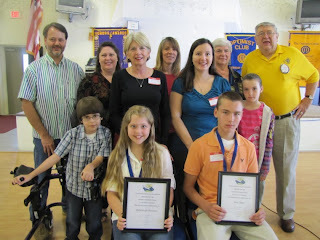 Scholarship programs are only one way that Optimist Clubs help children fulfill their full potential. Other programs that focus on youth sports, youth safety and community service, among others, allow students and adults to interact in ways that benefit both the kids and the adults and that interaction makes the communities with Optimist Clubs among some of the best places in the world to live. I have been studying the philosophy of Aristotle and I have learned that he believed the highest good is happiness. He wrote that individual happiness depends on the ability to activate your own powers and talents. Fulfilling your potential, or working toward that goal, will bring self realization and self realization brings joy. In my pursuit of happiness today, I found "The Freedom Song," by Jason Mraz to be fulfilling and knew I had to share it here on Experience Optimism for Music Sunday. What makes you happy? I took a walk today in a spring shower and I enjoyed it. There is something fragrant and soft that sets a spring shower apart from a winter storm and the promise of renewal is invigorating to the soul. It is as if a good friend has lured you from a sedentary place and asked you to come out and play. Along with the blossoms and buds that are sprouting on our trees and flowers, there are other signs of growth. Our communities are hosting elections and asking citizens to participate in making informed decisions about their futures. Optimist Clubs have also awakened from their winter hibernation and as they prepare for spring, they too are electing new officers that will lead them in the coming year and making plans for their newly elected volunteer leaders to attend the Optimist International Convention. A sign of spring for Optimist Clubs. What I find so exciting about new leaders is their commitment to inviting new members to join their cause. That is why in Optimist Clubs around the world we often say that March is for Membership. During this time of year, Optimist Clubs host "NOW" (New Optimists Welcome) events and take to the streets with membership applications in hand. When prospective new members balk at committing to the time it takes to join an Optimist Club, there is a secret weapon that all hosts can use: invite them to support your club's efforts by being a Friend of Optimists. No time commitment needed, only the desire to see good things happen for the youth and the community. Invitations work, friends; they really do. But you do have to make the effort to get your club's name and projects noticed. Realizing that Optimist Clubs need help gaining more visibility, this year, Optimist International has added an extra incentive for clubs to add members to their roster. All Optimist Clubs that add ten or more new members between March 1 and May 31, 2012 will receive a new road sign for their community. No forms needed. Optimist International will track your growth and supply your new Optimist Club road sign to your Optimist Club upon completion. Now that sounds like a plan for the rebirth of Optimism. I envision new road signs in bloom around the world. Help make my dream come true, won't you? We celebrated women on March 8 with International Women's Day, but I think we should celebrate women, ourselves, and each other every day. "Perfect" by Pink takes us through those imperfect days to straight to the celebration. And that is why "Perfect" was chosen for Music Sunday at Experience Optimism. You might even say that it is the song of the week. As part of the awareness for women that peppered the week, Girl Scout's former CEO, Kathy Cloninger, was quoted on Fast Company declaring that we need a "Decade of the Girl" in order to raise awareness and esteem, and to jumpstart parity between the genders. Although women make up 49% of the total workforce, the Institute for Women's Policy Research reports that at the current rate, women's and men's salaries will not reach parity until 2056. Women can't count on raising awareness to make a difference. There is some personal responsibility required. Some thoughts include, know yourself, don't be afraid to scrap, channel emotion and dominate, or at least take charge of office politics. And one of the hardest, but most important pieces of advice in my opinion that women must be ready to take: go to where the opportunities are. Women often sacrifice their careers for their families, but it's time to think of moving when needed. Other tips can be found at Fast Company. Last year I celebrated International Women's Day with an impassioned plea for more women to be chosen as international leaders for the umbrella organizations to which community service clubs like Rotary, Lions, Kiwanis and Optimist belong. In the twenty-five years since the Supreme Court ruling that enabled women to join these and other membership associations which were previously restricted to men, there has been only one woman rise to such a position. She represented the Optimist International organization. I guess that I should say congratulations to Optimist International for its forward thinking. However, instead, I'm going to make a confession about something that still stings to this day. Last year, not long after I saluted that woman for her achievements, she chose to defriend (unfriend?) me on Facebook. We weren't ever really friends. We knew each other through our volunteer involvement. However, at last year's international convention where I received the two top awards that Optimist International can bestow on a district leader, I chose to speak out in favor of a new program, The Childhood Wellness Campaign, over the existing Cure Childhood Cancer Campaign. To me, it's a very realistic choice that we should encourage Optimist Clubs to serve all children, not just those with cancer. I never said don't help kids with cancer. Childhood wellness speaks to all. The defriending took place immediately after the convention and that made me realize that by speaking out, I had become a target. I still haven't figured out if I am a target of those who fear my ideas, those who don't want another woman to succeed or those who prefer the balance of power to stay the same. It is a sad statement, however, when women in leadership positions who work for the same cause can't be civil enough to be connected through a social network. Our global, networked, engaged society has deemed March 8 to be International Women's Day. This is the day we champion other women, women's rights, and the struggles and successes of women around the world. It is not a day to whine over "why me;" but I shared my story for one reason alone: women must champion other women. It's okay if you disagree with their views and beliefs. It is not okay if you don't respect them enough to listen. If you can't hear what someone who is "like you" says, how will you ever understand those who aren't? As you read why International Women's Day matters, think about my story, as trivial as it may seem, as an example of how injustice prevails when someone turns a deaf ear to the communication they should hear. My plea for International Women's Day 2012 is that women and men will become better listeners. We must understand that such problems exist for women in order to fix them. This Ted Talk is funny, poignant and optimistic. Using humor, psychologist Shawn Achor talks about "The happy secret to better work" as he takes us from his childhood, an obviously happy time, to his days at Harvard. Despite the prestige, he explains that being at Harvard is not as blissful as getting in because once we achieve one goal, our brain pushes us to do the next best thing. Harvard students, therefore, continually pressure themselves to do better and better. Challenging? Yes, but important in our development. We should never settle, but there are ways to cope with the pressure and derive true happiness from our achievements and through that happiness, we are more productive. Please listen to Shawn Achor's presentation at TedxBloomington, filmed in May 2011 and uploaded in February 2012 and share your thoughts on happiness, gratitude, and productivity. Lately, I have been hearing "Under Pressure" across all media from the radio to television, movies and of course the internet. This song, by Queen and David Bowie, depicts a different musical era, yet its message rings clear for many today who are struggling to make ends meet. Our world is consumed by obstacles that create pressure for each of us every day. Pum-pum-pum -papapum-pum. Pum-pum-pum -papapum-pum. Pum-pum-pum -papapum-pum. Pum-pum-pum -papapum-pum. Pum-pum-pum -papapum-pum. Sound familiar and hopeful? The song is not all that scary until you add the Queen vocalizations and then it becomes, as advertised, under pressure. For Music Sunday at Experience Optimism today, I propose that we peel back the song to its bass line so it may be enjoyed instead of feared. So we might smile instead of worry, please give this rendition a try: "Ice, Ice, Baby," by Vanilla Ice. Even though the pressure is still evident, "Ice, Ice, Baby" highlights a different culture with a different view. It subscribes to the culture of optimism. Which pressure culture do you subscribe to? This morning I watched the following video from Jack Canfield, co-creator of the "Chicken Soup for the Soul" book series and I learned a new phrase: reversed paranoid. According to Mr. Canfield, that's what optimists are - reversed paranoids - for they take seemingly insurmountable obstacles and find a way over or around them. This idea reminds me of one of the lines from the Optimist Creed, "Promise yourself to talk health, happiness and prosperity to every person you meet." As a teenager, I would often go to a cafeteria-style restaurant with my parents where most of the patrons were "old." In my young mind, they had to be 70 years old or more for all they talked about was who had died, who was in the hospital, who was being wronged by some member of their family, and why they were so unhappy. I always thought how boring, I hope I don't do this when I get old. 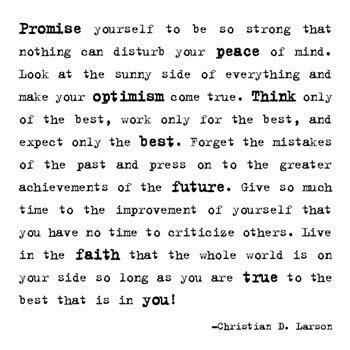 A few years later while in my 20s, I joined an Optimist Club and learned about sharing positive thoughts with others. It was then that I realized those "old" people from the cafeteria were younger than I thought, in some cases by twenty years or more. Then I thought, how sad it was that they didn't know how to change their attitude. It's true, talking about health, happiness and prosperity makes a difference in how we lead our lives. And sometimes, something as simple as changing your surroundings by joining a club can make all the difference in how you choose to think about yourself and others. Those paranoids at the cafeteria did nothing to reverse their situation. Their negative attitudes wore them down and made them look and feel much older than their real age. Optimism is a skill that gets better with practice, and one that you can achieve by creating your own positive attitude. Listen to the presentation now and start on your way to reverse your own paranoia. I know that you can do it: be an optimist. We often read about Johns Hopkins Research Hospital and the Optimist International Cure Childhood Cancer Campaign on this blog, but what we usually don't say is that our Canadian Optimist Clubs do not donate to that effort. Instead, the clubs in Canada support a campaign that keeps the money raised in Canada. Donations received pass through the Canadian Children's Optimist Foundation and on to the hospitals, research universities or families as designated by the contributing club. 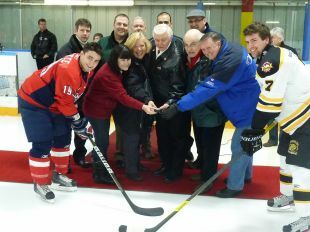 This photo, provided by the Vanier Optimist Club in the Eastern Ontario District - Optimist International was an opportunity to explain that small difference with the junior hockey team, the Cumberland Bandits, giving their support to the cause. In the special fundraising event on February 25, all proceeds from the door were donated to the Eastern Ontario fund to help build awareness of the disease and provide support to: children diagnosed and receiving treatment for cancer; families and care partners of children with cancer; healthcare and service providers; and research for cancer. Unfortunately the Bandits lost the game, 5-6 to the Vankleek Hill Cougars, but everyone who participated left a winner knowing they had contributed to an important cause. Thank you to the Vanier Optimist Club for the picture and story.